6 x 8 1/4 in. 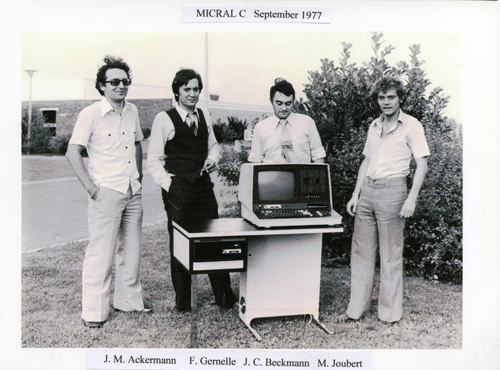 This a black and white image of a group portrait of four men standing on a lawn in front of a Micral computer. This image was shot during the daytime. The text at the top of the image is labeled "MICRAL C September 1977". The bottom is labled "J.M. Ackermann, F. Gernelle, J.C. Beckmann, M. Joubert". The computer contains screen, 2 floppy disk drives, keyboard, and is sitting on a desk.